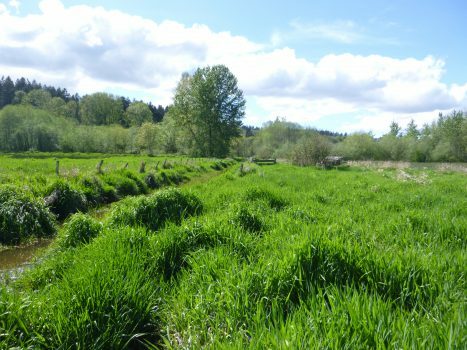 On April 28th, the Pierce County Agricultural Program sponsored a Farm Forum on Water Rights and Irrigation. Although there was no immediate solution to water rights issues in Clear Creek, there were definitely some interesting ideas that we will be following up on. There were four speakers at the Farm Forum who each gave a presentation followed by a brief Q&A. A copy of each presentation is available on our Resources page, under Presentations. Part of the drainage system known locally as “Nancy’s Ditch”. Our main takeaways were that, according to the Department of Ecology, it is extremely difficult and expensive (and highly unlikely) that landowners are able to successfully obtain a new water right. The presenter, Mike Gallagher, suggests that the best option for small farmers is to either buy land with existing water rights, or, obtain a small amount of acreage, dig an exempt well, use rainwater harvesting methods, and/or use the Industrial Groundwater Exemption to irrigate. Michelle Harris, from the Tacoma-Pierce County Health Department informed the audience about the steps involved in drilling a new, exempt well. Jason Hatch, from Washington Water Trust (WWT), presented on some alternatives for water resources that have worked in other areas, including Water Trusts, Water Banking, using recycled water, and establishing a special Watershed Improvement District. The Farming in the Floodplain Project team is planning a follow-up meeting with WWT to learn more about potential options for Clear Creek. We will share anything relevant that we learn from them! Finally, Dr. Troy Peters from WSU spoke about the science behind their Irrigation Scheduler app (for iPhone or Android, and available online). 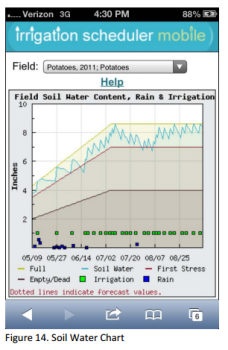 This app helps farmers and growers plan the best way to use the water that is available to them. A manual for the Irrigation Scheduler app is available here. More complete notes are available HERE.